In this post, I’m going to propose a concept that even most Christians may not have considered. However, I think the evidence is all around us in the modern world that this concept is a true one. Allow me to first present some background information. When ancient Israel’s tribes made a covenant with the Creator God, there were promised blessings for obedience to God’s laws and promised curses when God’s laws were disobeyed. Many of these blessings and cursings were set forth in Deuteronomy 28. Good weather and crop harvests would come as a direct result of obedience to God’s laws (verses 8, 11-12). Droughts, crop failures and weather problems would also come as a direct result of disobedience (verses 22-24, 38-40). Rain “in due season” was promised if they would obey God (Leviticus 26:4). In other words, rainfall would come in moderate and timely amounts, but they would not have floods and droughts. Ancient Israel eventually went into exile (the ultimate penalty for breaking the covenant with God) due to their chronic disobedience to God’s laws. At one point when the northern kingdom of Israel had particularly evil leaders, the Prophet Elijah even pronounced a three and one-half year drought on the nation (I Kings 17-18). In Leviticus 18:25-28 and 20:22, God warned the Israelite tribes that if their sins increased to a certain point, that the land itself would “spew” or “vomit” them out. However, we can easily not notice a key point in these warnings. In Leviticus 18:28, God warned them that if they sinned as a nation, the land would spew them out “as it spewed out the nations that were before you.” This reveals that the warnings about climatological blessings or cursings apply to all nations at all times, not just those nations that have a covenant relationship with God. It doesn’t matter whether you are Israelite, Jew or gentile. It doesn’t matter what race you are in or in what continent you dwell. Any nation or people that openly revolts against God and disobeys him will find the very elements of the earth will also revolt against them and curse them as a direct consequence of their sins. Many nations and empires have fallen as a result of the application of this principle. Mankind tends to think of God as being a Zeus-like figure who hurls afflictions upon people like lightning bolts on an ad-hoc basis in reaction to mankind’s actions. Leviticus 18:28’s language shows that God was not warning the Israelites that he would clobber them in a fit of divine displeasure whenever they sinned.That verse indicates that God was revealing to the Israelites a divinely-ordained reality of cause and effect that was already hard-wired into the very fabric of the creation itself. He was revealing this fact to them so they could live their lives in harmony with the creation around them and not be cursed by it. As evidence that this principle is hard-wired into the creation, Adam and Eve enjoyed a perfect existence on earth when they had not sinned in the Garden of Eden. They had perfect air, perfect soil fertility, perfect food and water, perfect weather, etc. I believe that the very earth itself was alive with positive, life-giving energies when they walked on it in a state of perfection with God. After they sinned and “fell from grace,” the very earth “fell” with them and also became cursed. Genesis 3:17-19 describe how the earth quickly became less welcoming to their efforts and thistles and thorns were introduced into their earthly ecosystem. Genesis 3:17-19 and Leviticus 18:25-28 reveal that the physical earth and the spiritual condition of its inhabitants have a direct and causal relationship with each other. Modern mankind is still in an ongoing relationship with our Creator God whether we know it or not and whether we like it or not. Modern mankind has increasingly been disobedient and rebellious to the Creator God, even to the point of pretending to itself that our Creator does not exist. As this global trend has accelerated, our global weather has become increasingly contrary to mankind all over the world. At first “man-made global warming” became a mantra of the globalists as they sought supranational powers and regulations to give themselves control over the nations. The science supporting that assertion was never very good so the globalists have changed their credo to “global climate change.” They still assert mankind is responsible for all these weather disasters. They may be right, but not in the way they think. I believe that the inherent law of Genesis 3:17-19 and Leviticus 18:25-28 is being implemented all around us on the entire earth. The very real and automatic but invisible causal links between the spiritual world and the physical world are cursing an increasingly sinful mankind with an earth whose elements are increasingly punishing mankind for its growing sins against the divine laws of the Creator. In ancient times, it took considerable time for the sins of individual empires and kingdoms to spread to other peoples. That was understandably due to low-technology. International travel and communications were very slow and limited. Trends and lifestyle behaviors, whether good or evil, could take centuries to spread very far. In today’s world, global digital connectivity is so instantaneous that sins and sinful attitudes that once would taken centuries to spread around the world can now infect the entire earth in a very short time. 2 Timothy 3’s prophecy includes a long list of the sins and degeneracies that would characterize mankind’s society in the latter days of our age. Romans 1:17-32 offers another list of sins that take hold in societies that “do not like to retain God in their knowledge” (verse 28). Does modern mankind choose to “not retain God in its knowledge?” We all know the answer is “yes.” The teaching of the utterly phony theory of evolution has institutionalized the rejection of God in society (as Romans 2:17-32 prophesied it would). With the above in mind, let’s take a very quick look at some of the global climate change curses which are striking our planet. 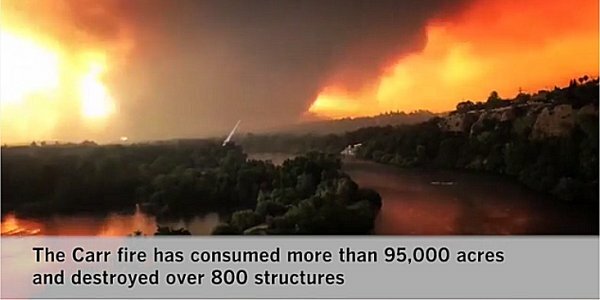 The first link details the very severe wildfires in California and the damage they have caused. The dry season in California is just getting started, and some of my previous posts have documented that climate scientists are warning that California and the American Southwest are entering what could be an epic drought that will last decades. The second link, third link and fourth link detail the record heat waves that are hitting European nations. Germany is having crop failures due to drought and its rivers are drying up to the point that shipping is being reduced on its rivers, Spain and Portugal are being scorched with heat, while France faces crop failures due to too much rain and its farmers are calling suicide prevention services due to the dire situation they face. The fifth link mentions the actions of a group of Canadian farmers who warn that GM foods could cause long-term crop damage [a recent post examines that very topic and the possibility that genetically-altered foods are killing off vitally-needed bees and other pollinators]. The sixth link warns that a global food shortage could hit quickly if there are simultaneous crop failures around the world. We know from recorded history that large volcanic eruptions can cause global cooling very quickly. In the past, volcanic eruptions in the region of modern Indonesia caused global cooling and shortened Europe’s growing seasons so their crops froze early and many people starved to death. The seventh link mentions a volcanic eruption a few days ago in the Pacific which was big enough to cause the island of Vanuatu to be evacuated. Is another large volcano in some part of the world going to reprise the global climate/crop disasters that were caused by the Krakatoa and Tambora eruptions? Nations that are facing food shortages do not starve quietly. They will wage war to take food from nation that do have food. Earthquakes, famines and wars are all prophesied to characterize the latter days of our age (Matthew 24:7), and the term “earthquakes” surely includes tectonic activity such as volcanoes. The final link comments on the fact that some parts of the world are being hit by severe heat waves while other parts of the world are experiencing unusual cooling. It also briefly touches on the possibility of a “pole shift” (where the magnetic poles of the earth change quickly or even reverse) affecting the earth’s physical realities. What is the conclusion of all this? Since mankind is increasingly rebelling against God and his laws, the principle of Genesis 3:17-19 and Leviticus 18:25-28 is asserting itself to a greater degree in the world’s climatic conditions. I’d love to see global repentance and reversal of the present negative trends, but I don’t think that outcome is likely. Therefore, expect global sinfulness and global climate disasters to both steadily increase. What the world does not see is the correlation between the two realities. When all nations have become more sinful, all nations will increasingly feel the effects of the earth itself punishing the nations in its weather, climate, etc. A simple reality that is hard-wired into the physical creation can be stated as follows: When mankind rebels against God, the earth itself will rebel against mankind.” This is an inexorable law, and it is unfolding all around us. Keep in mind God can override anything that might happen. People who fear God need to pray that God will bless their neighborhoods, regions, etc. with favorable protections. We should never take his protection for granted. We should ask for it continually, and remember to thank him when it is given. It would be great if some entire nations humbled themselves before God and asked for his mercy and protection (like ancient Assyria did in the book of Jonah). I will not offer specific predictions about what weather calamities will occur or where they will occur. They will happen. While Matthew 24:7 warns about earthquake and tectonic activity in the latter days, Luke 21:25 warns about hurricanes and tsunamis in the latter days (“the sea and waves roaring”) and Revelation 6:5-6 foretells severe food shortages will occur in the latter days. For additional information on some of the topics mentioned above, I urge you to read my article, Are We Living in the Biblical Latter Days? and for biblically-based ways to prepare for what is coming, I urge you to read my article, Should Christians Prepare for Future Hard Times?